Lets Boycott – Friday 8th August 2014 – footsteps……..
Zionis are killing children and women inhumanly in Gaza. They are the actual terrorist and a puppet of United States of America. Only insane human being will clap their hands for what the Zionist had been terrorising Gaza. While Hamas and their brave warriors are on the front line to thwart Zionis terrorism what do we, who has no combat experience at all, do to help them. The only answer we have is our will to show the Zionist that we condemn what they are doing arrogantly. Economy. We can put our heart to boycott companies that support Zionist and the Illegal state of Isreal. When we boycott their product it doesn’t mean we want to kill their industry but we are sending a serious message that we condemn their monetary aids to the Zionist. Thats the clear message. 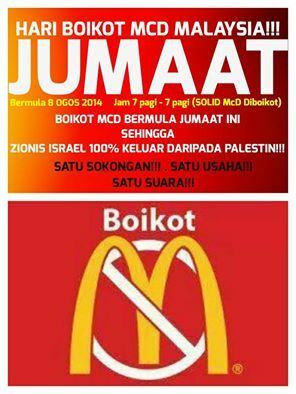 The community is putting their hands together to send the message and FRIDAY 8th AUGUST 2014 will be McDonalds Boycott Day. Let us all help make this event a happening. Every penny you give to McDonalds means more money to kill innocent children and women in Gaza. Next Post Government To Ban Facebook?